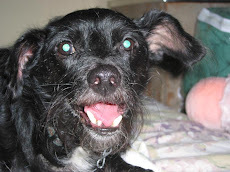 My dog says it's Pet Dental Health Month! Woof! Yep, just like people, dogs and cats need to keep their teeth healthy. Check out this video from the American Veterinary Medical Association which will show you how to clean your pet's teeth at home. *Warning: Among other things, the video advocates using rawhide as a way to clean your dog's teeth. You should NEVER let your dog chew on rawhide. Not only can it become slimy and get stuck in your dog's throat (it happened to my doggie brother! ), most rawhide is made in foreign countries and contains formaldehyde. Rawhide is not something you should ever give to your dog.